The Master Riveting, Bending & Rolling tool from Metalcraft is so much more than just a metal rolling tool to curve steel. 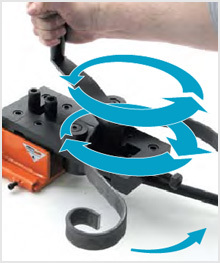 It is also a metal bender which can bend angles up to 60 degrees using its’ special diamond shaped forming head making this great bending tool a must for anyone looking for quality metal forming equipment. Additionally, you can rivet metal together using the cold riveting system which squeezes a mild steel rivet (also available from Metalcraft) placed in the holes punched on our Master Punch & Shear tool to create a very strong joint without you needing to invest in welding equipment and training. Little wonder these tools prove so popular with hobbyists, DIY’ers and schools. 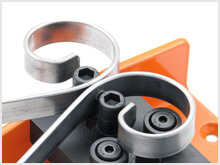 For the great price, its is arguably the most popular metal bending hand tools around today.